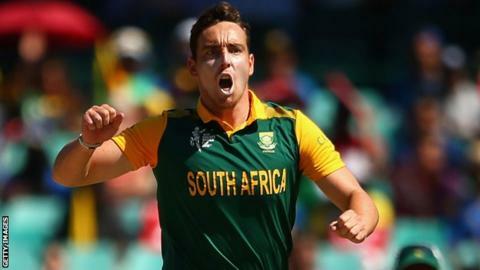 Middlesex have signed South Africa fast bowler Kyle Abbott for the first half of their T20 Blast campaign. Abbott, 27, has played three Tests, 15 one-day and eight T20 internationals, and will join in May, subject to clearance from Cricket South Africa. "Our priority for a second T20 player was a high-quality fast bowler," Middlesex managing director of cricket Angus Fraser said. "We think we've signed someone who will significantly strengthen our side." Abbott played four games for South Africa at the World Cup earlier this year, taking nine wickets at an average of 14.44. He has taken 51 wickets at 28.72 in his 56 career T20 appearances, with an economy rate of 7.43 runs an over. The right-armer was the overseas player at Hampshire last season, playing 12 games in the T20 Blast, and is currently representing the Chennai Super Kings in the Indian Premier League. "I enjoyed my time in England last year immensely and I am looking forward to a new and exciting challenge with Middlesex," Abbot said. "It is an honour to have signed for such an illustrious club." Abbott will be available for seven of Middlesex's group fixtures before before joining up with South Africa at the end of June for their tour of Bangladesh. Australia batsman Joe Burns will also represent the Lord's side in the T20 Blast and County Championship after he takes over the main overseas player role from compatriot Adam Voges in May.